English: White-shafted fantail; French: Rhipidure a collier; German: Graufacherschwanz; Spanish: Cola de Abanico Gris. 5.5-6.6 in (14.0-16.8 cm); 0.2-0.3 oz (6-9 g). Plumage color ranges from light gray to dark brown-gray. White from chin to top of throat; also white brow and tail tips. 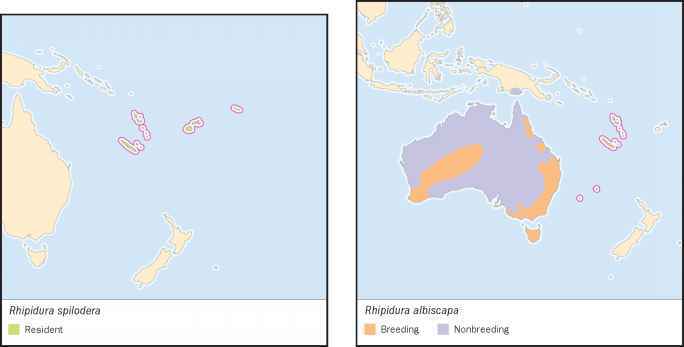 R. a. preissi: southwestern Australia, reaching northwestern Australia on migration; R. a. alisteri: south central, southeastern, and east central Australia, on migration to northern Australia and possibly New Guinea; R. a. albiscapa: Tasmania and Bass Strait islands, southeastern Australia on migration; R. a. keasti: northeastern Australia; R. a. albicauda: C. Australia; R. a. pelzelni: Norfolk Island; R. a. bulgeri: New Caledonia and Lifu, Loyalty Islands; R. a. brenchleyi: Vanuatu, Banks Islands; San Cristobal, Solomon Islands. Can be found in almost any wooded habitat, including urban situations, rainforest, eucalypt forest and woodland, semi-arid scrublands, mangroves, and riverine vegetation. Territorial; usually solitary or in pairs; often joins mixed feeding parties. Extremely active and conspicuous; inquisitive and confiding. Frequents all levels of foliage. 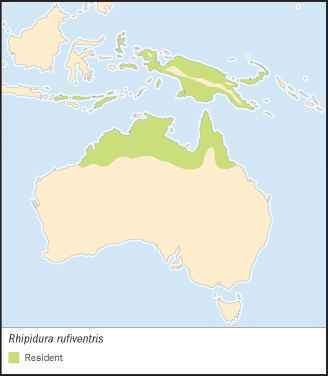 Populations of southern Australia and Tasmania are migratory, those of central Australia are nomadic and those in northeastern Australia and on Pacific islands are sedentary. Song is a series of high-pitched and thin but attractive notes, given in a "see-saw" cadence and sometimes likened to a violin. Eats small insects. Forages mainly by hawking on the wing in involved intricate acrobatic chases; sometimes gleans from foliage. 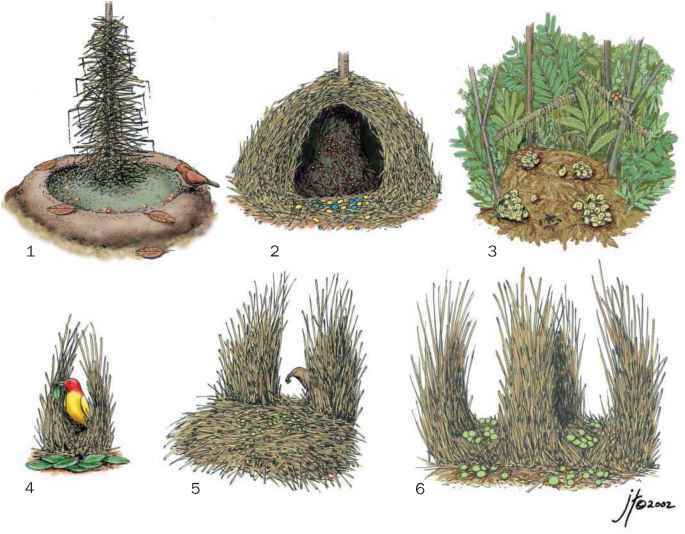 In Australia, breeds Jul.-Jan.; produces one, two, or often three broods in a season. The sexes share the breeding duties. The nest is the typical fantail structure: a small cup of thin grass bound with spider web, with pendent tail up to 6 in (15 cm) long, placed in a fork. This is usually 6.5-16.5 ft (2-5 m), sometimes up to 33 ft (10 m), above the ground. The eggs, 2-4 in a clutch, are cream with small light brown and underlying pale gray spots form a wreath at the larger end. Incubation takes 14 days, age at fledging 10-12 days. Common in most of its range.